Grade 4 and 5 students from South Nelson School spent an entire day last week getting the low down on what we throw down. Apr. 29, 2016 8:00 a.m.
South Nelson students recently toured the Ootischenia landfill and learned there is only space for another 30 years’ worth of waste. As part of Wildsight’s Beyond Recycling program, Grade 4 and 5 students from South Nelson School spent an entire day last week getting the low down on what we throw down. This enlightening tour of the Ootischenia landfill, the Waste Management recycling facility in Brilliant, the RDCK transfer station and the Nelson Leafs bottle depot painted the students a complete picture of what happens to our stuff when we throw it away. Beyond Recycling, a 24-week program, tackles topics such as energy, waste and consumption. Using a hands-on approach and local community expertise, the program empowers students to come up with creative and positive solutions to environmental challenges. 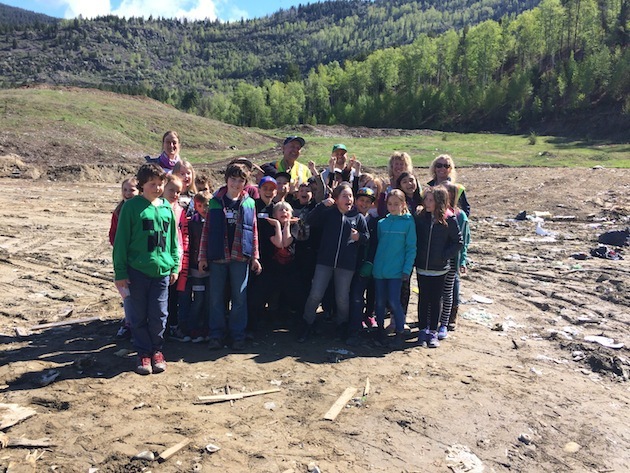 At the Waste Management facility, students discovered how much recyclable material is collected, compacted and shipped off for sorting and recycling in the West Kootenay. The importance of cleaning packaging before it goes to recycling was obvious when students found out that bucket loads of recyclables can end up in the landfill because of one dirty peanut butter jar. The next stop on the waste tour was the transfer station and Ootischenia landfill. Students observed how careful management of waste is paramount. When waste comes to the transfer station, materials are sorted and can sometimes be diverted from the landfill. After learning there is only space for another 30 years’ worth of waste at the Ootischenia site, students realized how essential it is to make smart consumer choices like reusing and fixing items, composting and recycling. At the Nelson Leafs bottle depot, students continued to learn about product stewardship and strategies to keep small appliances, electronics, light bulbs, chemicals, paint and refundable drink containers out of the landfill, reducing our need to extract new resources. The day was an eye-opening adventure into waste management. On the bus ride back to school, students talked about how the best thing we can do to minimize our waste is reduce the amount of garbage and recyclable materials we generate in the first place.